Iron and Manganese are common in groundwater and typically seen as nuisance contaminants that can cause discoloration and taste issues. In addition to the effects, iron and manganese have on drinking water, these two contaminants create headaches in many industrial and commercial process applications, including boiler feeds, cooling towers, and industrial remediation among others. The USEPA lists iron and manganese as secondary contaminants and sets their maximum contaminant levels at 0.3 mg/L for iron and 0.05 mg/L for manganese. 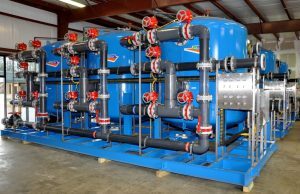 AdEdge Water Technologies uses AD26 oxidation/filtration media or ADGS+ coagulation/filtration media for the removal of these contaminants. These processes allow for significantly higher flow rates per square foot of media, less backwashing, and small footprint systems which lead to lower capital and operating costs. AdEdge offers a line of packaged, pre-engineered APU systems, which are the ideal solution for public water systems, schools, subdivisions, and more. We also have a line of modular treatment systems that arrive unassembled, ready for hook-up when they are installed on site. These solutions can incorporate the oxidation/filtration and/or coagulation/filtration treatment processes with pre-and-post treatment for a complete integrated system. What are the advantages of AdEdge’s iron and manganese solutions? High filtration rates while maintaining a small footprint. Capable of treating water with flow rates ranging from 10 GPM to over 12 MGD. Hundreds of iron and manganese solutions throughout the United States, Canada, and Latin America. Superior handling properties, stability, and NSF 61 certification. Long media life – typically over 10 years before replacement. Highly catalytic/oxidative activity for co-precipitation. If you have iron and manganese in your water, AdEdge has the best solution for you. Click here to contact us or fill out a site profile form and we’ll start working on a customized solution for you. © Copyright 2018 by AdEdge Water Technologies, LLC. If you need any specific information about our solutions, feel free to request a call back or schedule a time to talk to one of our engineers. We're here to help, please don't hesitate to reach out.